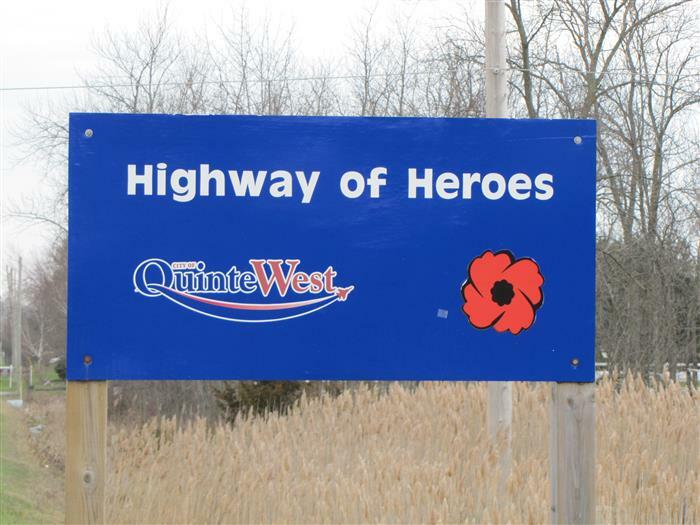 First Sign on the Highway of Heroes. Re: First Sign on the Highway of Heroes. I posted this photo without explanation as I wanted to see the effect, if any, it has on the members here. As far as I know, this is the first sign declaring the start of the Highway of Heros. It is on County Road 22, Quinte West, also know as Hamilton St. It is located approximately 200 meters from RCAF Road in Trenton. Not sure what the effect is that you talk about, but I think it is a nice sign befitting of a grateful nation. Not sure if I like a municipalities logo on there though. Just hope the theives and vandals keep their paws off it and all the other signs. Honestly Dale, the effect could be anything I suppose. In my case, I was just driving down the road, minding my own business when I saw this sign. I noted right off the bat it is NOT Bilingual. The signs along highway 401 are all bilingual. This sign is very blue, for lack of a better description. It really 'pops' against the open country area around it. I agree the Quinte logo is a bit off however, I suspect it was chosen to show the Quinte Region's official support. Being from Alberta, we don't see many bilingual signs here. Never thought of that.